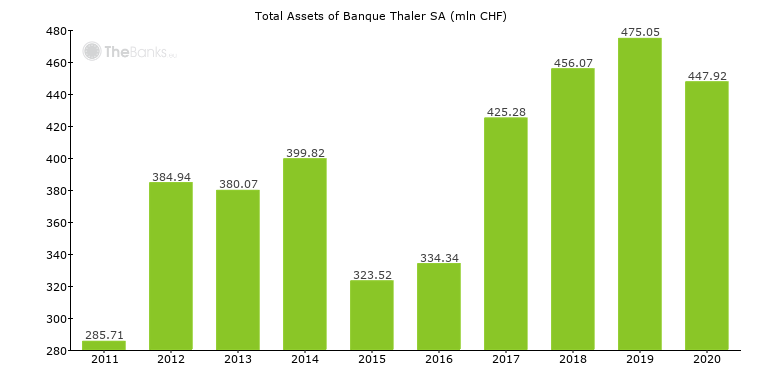 In 2017 total assets of Banque Thaler SA were 425.28 mln CHF. Growth compared to the previous period (2016) was 27.20%. The evolution of the total assets of Banque Thaler SA is shown at Chart 1 below. Chart 1. Total Assets of Banque Thaler SA. 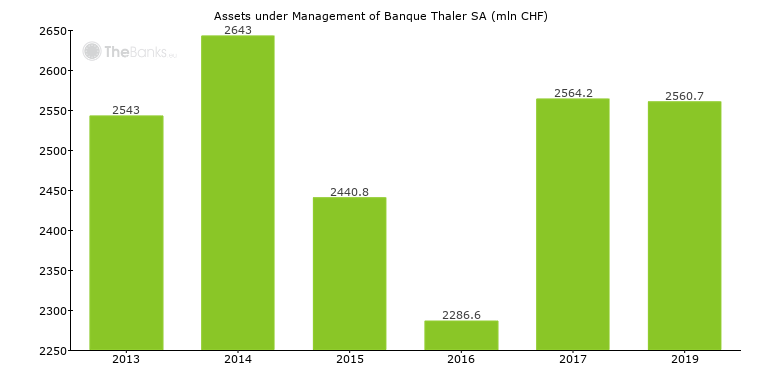 In 2017 assets under management of Banque Thaler SA were 2,564.20 mln CHF. Growth compared to the previous period (2016) was 12.14%. The evolution of the assets under management of Banque Thaler SA is shown at Chart 2 below. Chart 2. Assets Under Management of Banque Thaler SA. 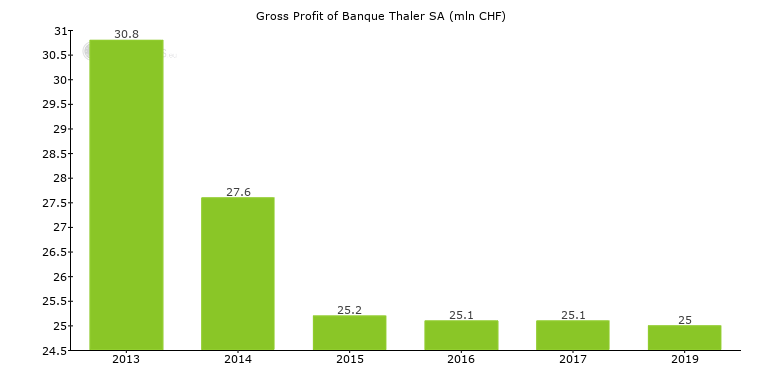 In 2017 gross profit of Banque Thaler SA was 25.10 mln CHF. The value didn't change compared to the previous period (2016). The evolution of the gross profit of Banque Thaler SA is shown at Chart 3 below. Chart 3. Gross Profit of Banque Thaler SA. Recent changes in gross profit of Banque Thaler SA and its main components are shown in Table 1. Table 1. Recent changes in gross profit of Banque Thaler SA (mln CHF). 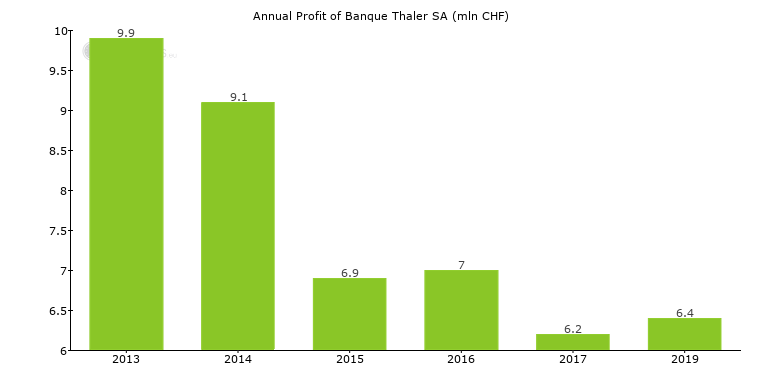 In 2017 annual profit of Banque Thaler SA was 6.20 mln CHF. Decline compared to the previous period (2016) was -11.43%. The evolution of the annual profit of Banque Thaler SA is shown at Chart 4 below. Chart 4. Annual Profit of Banque Thaler SA. In 2017 there were 35 employees of Banque Thaler SA. Growth compared to the previous period (2016) was 14.19%. The evolution of the number of employees of Banque Thaler SA is shown at Chart 5 below. Chart 5. Number of Employees of Banque Thaler SA.